When life gets really busy, getting dinner on the table every night becomes a challenge. That’s why I’ve rounded up an entire month’s worth of tried and true Instant Pot dump recipes. Looking for a reason to love your Instant Pot? Whether you just hate spending time in the kitchen or you lack the time, these Instant Pot dump recipes will provide you with plenty of effortless meals all month long! 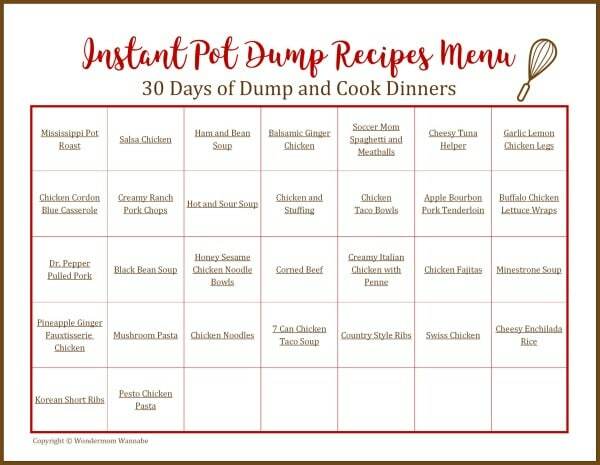 I’ve created a menu for a full month using only Instant Pot dump recipes. I tried to vary the selection from day to day so you don’t end up eating a noodle dish or chicken dish several days in a row. I’ve also included some soups and vegetarian options to help keep cost down. Feel free to print off the menu. The recipes included in the menu are all hyperlinked in the menu and in the list below the menu. Looking for Instant Pot Freezer Dump Meals? I know that for many people, “dump meals” translates to meals that you prep in advance and freeze then toss in the Instant Pot to cook. That was NOT my criteria for these recipes. 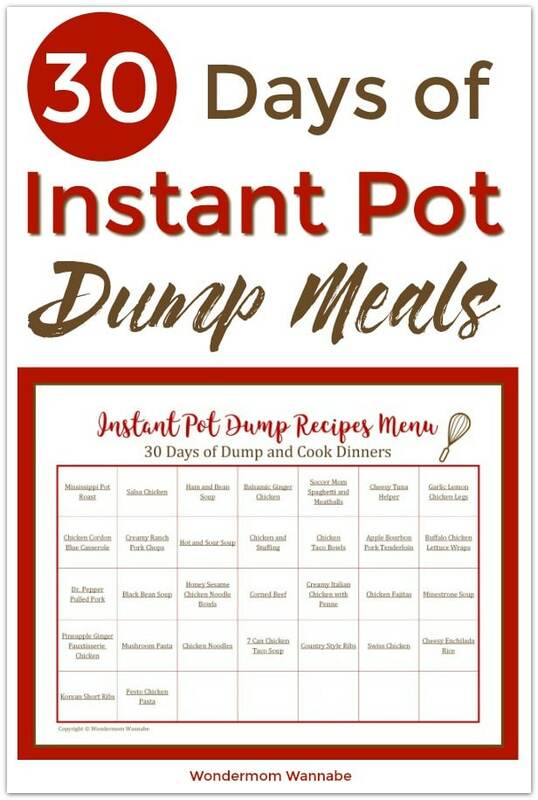 However, if those are the type of dump recipes you are looking for, I’ve put together a collection of over 20 Instant Pot Freezer Meals just for you. Every recipe on the list is designed to go from freezer directly to your Instant Pot. You won’t find any recipes in this meal plan that require you to saute ingredients first. I also omitted any recipes that required a lot of slicing and dicing beforehand. A couple of the recipes do call for time to marinade before cooking, but the marinade had to be simple (e.g. dumping the necessary ingredients into a Ziploc). And, after marinating, you only have to dump the ingredients into the Instant Pot to cook. If you liked this menu of Instant Pot dump recipes, you might like some of these other easy dinner ideas. Love your Instant Pot? 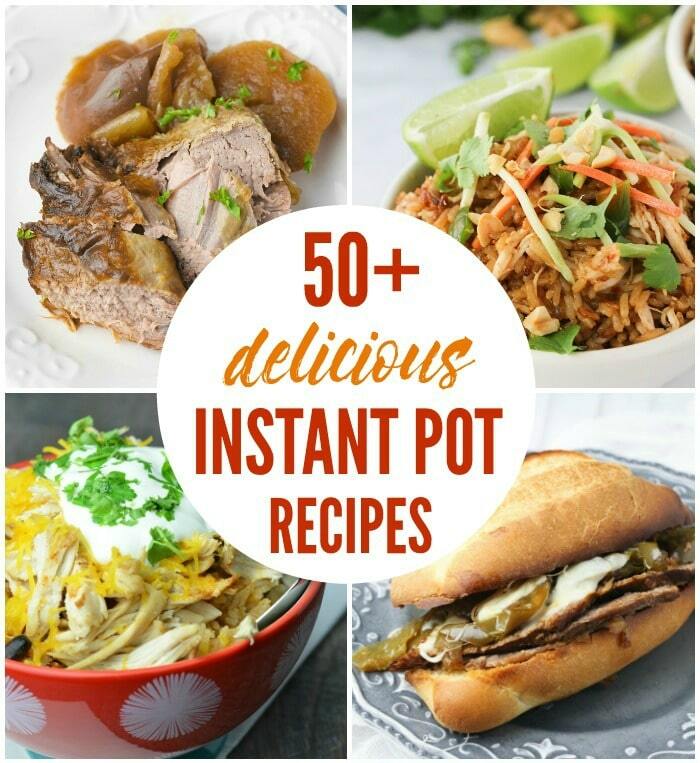 Check out my entire collection of Instant Pot recipes. You’ll also find my favorites from other sites plus lots of helpful information (like which accessories you might want and a glossary of common terms). 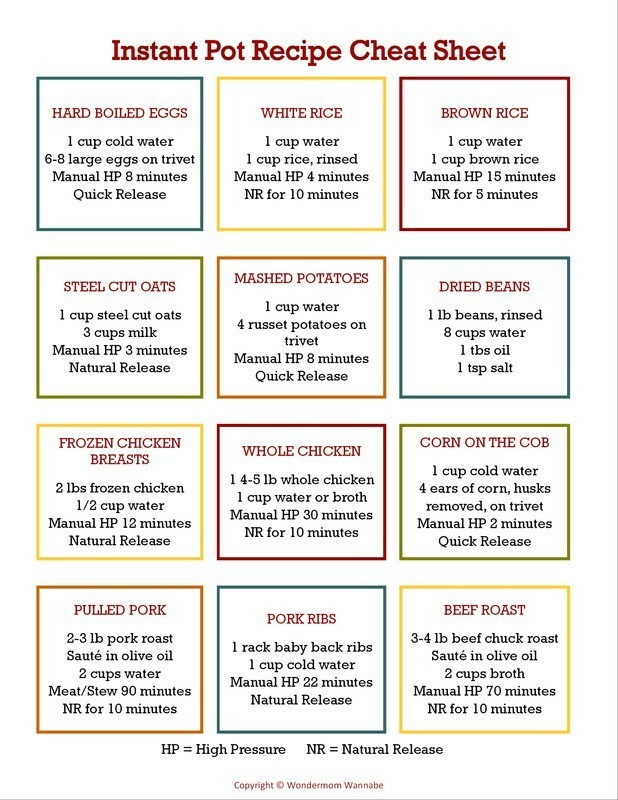 If you like having an entire month of recipes already planned, check out my menu for a month of family meals. They aren’t dump recipes, but they are all kid-approved (in my household anyway). Only cooking for one or two? Check out all of these microwave mug recipes! Or perhaps you’d rather come up with your own meal plan. If that’s the case, read this post on Easy Meal Planning for tips and ideas. 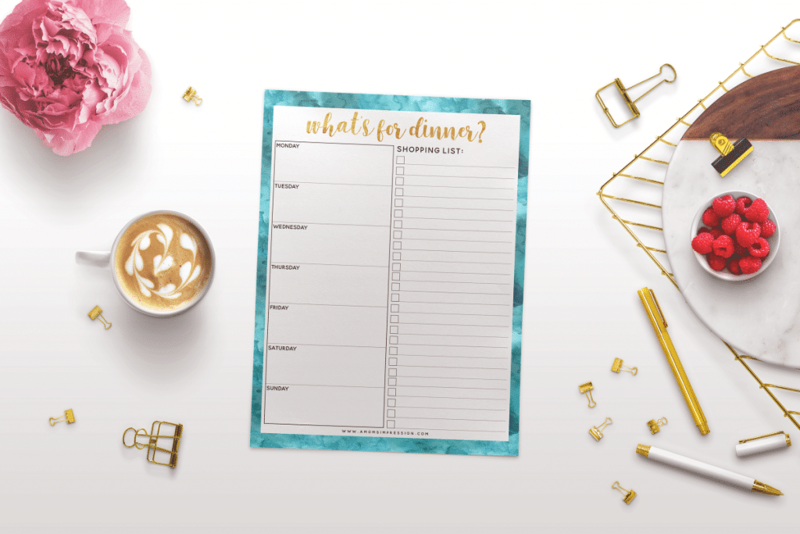 Plus, snag a free printable meal planner and shopping list! 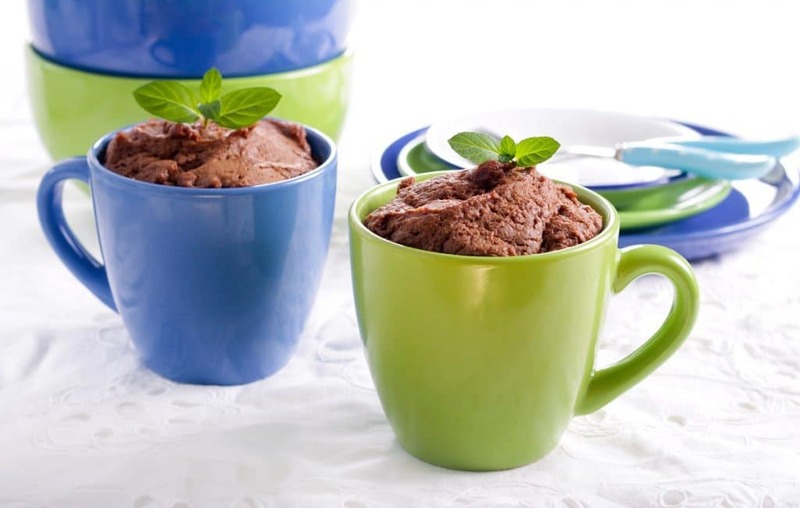 Previous Post: « Delicious Microwave Recipes in a Mug from Breakfast to Dessert! Are these all 6qt pot meals? I only have a 3qt pot. I haven’t used it yet but seems like everyone says I can take the 6qt recipe and cut it in half. Do you think that would work on these? Hi Joan, yes, I believe most of the recipes are for a 6 quart. Usually, the recipe will specify if it’s for the smaller pot. I don’t have the 3 quart so I can’t say for certain, but I do believe most of these can be converted by simply using half the ingredients. The only problem might be if that reduces the total liquid too much so that the pot won’t come to pressure. Just make sure that when you cut the recipes in half, it still leaves whatever the minimum liquid requirement is for the 3 quart. I have a 3 qt . If all the ingredients stay within the 2/3 line of the pot liner, you can use the recipe as is without having to make adjustments. Just make sure you do not go above the max line inside the liner. I didn’t see it any where but would you freeze each meal until ready to use? If I were to do all the meal prep ahead of time? Just thaw, dump, cook? Hi Shellie, I didn’t search for recipes that were exclusively freezer dump meals so not all of the recipes in this menu will work that way. 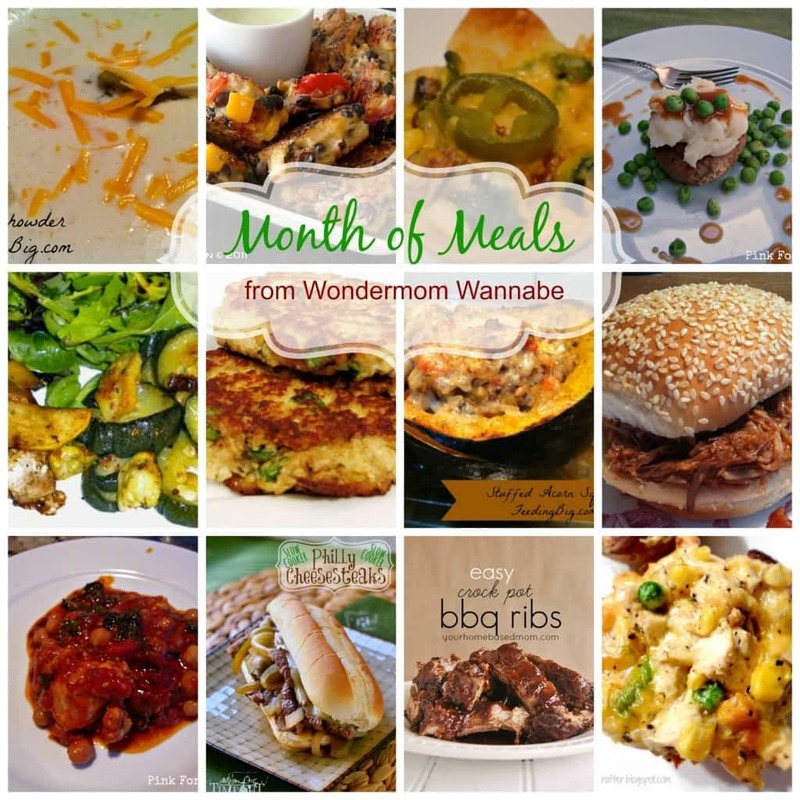 However, Once a Month Meals has awesome one-month menus of Instant Pot freezer dump meals. Check them out here. Did u finish the grocery list?! I was trying to find it! This looks prefect. Do you have a grocery list together for this? I do not, but I’m adding that to my to do list right now! I think a lot of readers would find that helpful. Thanks for the suggestion. Typically recipes for chicken thighs have longer cook times since bone-in chicken takes longer to cook. Cooking time for breasts can vary quite a bit depending on the size of the breasts. If you’re using large breasts, only reduce the cook time by 2-3 minutes, if small or tenderloin size, reduce cooking time to 8 minutes total. The chicken breasts will be drier than thighs so only do this in recipes with plenty of liquid and/or a sauce.